LAHORE: (Thursday, November 12, 2015): Rector Yasar University Turkey Prof Dr Mehmet Cemali and Director International Office Ms Patricia Turmenoglu called on Punjab University Vice Chancellor Prof Dr Mujahid Kamran at his office here on Thursday. 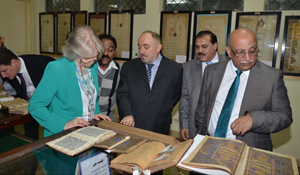 PU Registrar Prof Dr Liaqat Ali, Dean Faculty of Behavioral & Social Sciences Prof Dr Muhammad Zakria Zakar, Director External Linkages Dr maria Maldonado and a PhD scholar at Yasar University Khawaja Ahmed Muneeb Mehta were also present on the occasion. The meeting discussed various issues of mutual interest and stressed the need to enhance academic collaboration. 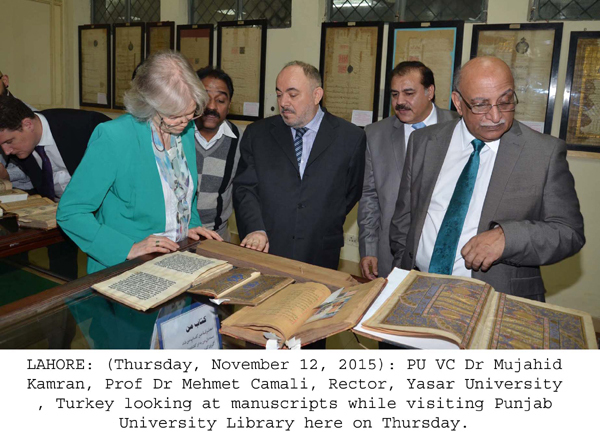 Later the delegation and PU VC Dr Mujahid Kamran visited PU Library.